As someone dealing with Post Concussion Syndrome, and a student of Cognitive Science, I was very impressed by a recent lecture on pain given by Dr. Jeffrey Mogil. It appears that the paradigms used by pain researchers have not been applied or adapted to Post Concussion care, nor have pain researchers considered Post Concussion Syndrome as a case of chronic pain. What makes post concussion pain so unusual under the pain paradigms is that it is a case of chronic pain that appears to be evoked pain, since it correlates with certain activities. Typically, chronic pain is thought to be spontaneous, that is, not correlated with a particular activity. This contrasts acute pain, which warns of a danger to quickly avoid, or tonic pain (days, weeks or a few months) which suggests rest and immobility of the pained area, to optimize healing. In contrast, chronic pain is considered spontaneous because the pain seems to persist after its cause is no longer there (like phantom limbs continuing to hurt). In the cases where the cause does persist (like in cancer pain) researchers wonder if the pain might promote general caution, which might keep the individual away from dangerous situations considering their compromised health. It certainly directs them to a healthcare professional, which hopefully increases their chance of recovery. In all cases, pain acts as a clue that something is wrong. What makes chronic pain so strange is that often, the only thing that is wrong seems to be that the person is experiencing pain. This has been a breakthrough in thinking because it allows both the patient and the doctor to only worry about the problem of pain itself. But when something more is going on, it is important to use the bodies clue to explore underlying issues. Pain from inflammation might be caused by the food someone eats, which means that any other method of mitigating that pain would leave the underlying inflammation a serious health problem. When evoked pain is correlated to an activity, the message is clear to avoid the activity. This works so well in the case of the broken arm. Any movement causing pain is avoided. However, with inflammatory pain evoked by food, it might feel spontaneous. This is because the pain does not occur immediately after eating the food, and it becomes a challenge to sift between many possible causes. Pain may feel spontaneous on the surface before we understand what is evoking it. How many types of evoked pain might we be missing? I would argue that Post Concussion Syndrome is a case of chronic pain that is evoked. This means that the pain occurs when the individual does certain activities, and stops when they stop doing the activity. Like in the tonic case, this can be useful to prevent the individual from overdoing themselves. The problem is that the pain might be correlated with doing most of the things that provide meaning in life: music, socialization, exercise, reading, playing games, and thinking deeply. New research agrees that doing nothing all day in a dark room does not promote recovery. The problem is that when the sensation of pain is so strongly correlated to the level of activity, even low levels of pain stop activity. In my case, it's not necessarily the intensity of post concussion pain that makes it debilitating, it is the fact that it pops up whenever I start to do something. That, and its direct association to the times when I can't think and feel myself slowing down. Like with a food sensitivity, the evoked pain of Post Concussion Syndrome does not always arrive immediately after a provoking event. Instead, it might take a few hours to kick in. This makes it hard to directly pinpoint which activities are more problematic. In addition, it seems to be cumulative, so that something that is usually not a problem or even energizing can provoke pain on a low day. This cumulative effect can often cause unpredictable crashes when looking at the last day. It is only in looking at the last few weeks that levels of pain and fatigue make more sense. For these reasons, the evoked pain can be even more frustrating, because it is not easy to get a grasp on. It is much more complicated than keeping an arm still. At its most extreme level, a concussion effects almost every voluntary behaviour. When teaching children, I explain that the first step to recovery is No Activity. When asked what they can still do, we list sleep and eating as the two safe bets, though sleep disturbances and nausea may make even these activities difficult. We tell the kids to stay in this stage until they have no symptoms, and then slowly to progress up to Some Activity, More Activity until Back To Normal. We stress that at the sign of any symptom, they should return to No Activity. The underlying message to this procedure is clear: activity provokes symptoms. Evoked pain. This procedure for an injury to the brain is along the same lines as one you would advice for an injury to the arm, with one key difference. Behaviour involving the arm is localized, behaviour involving the brain is pretty much all behaviour. Most people are pretty bad at doing nothing, which makes it essential that this advice is given in a way that increases its chance of being listened to. Doing nothing might look different for different people. Anxiety can be a huge energy drain, and crying all day can cause a headache worse than the concussion. This makes concussion protocol a difficult balancing act. The key message is to rest, the hard question is what does that look like? 90% of concussions resolve in 6-8 weeks. The numbers might change but the message we tell children is clear. Concussion recovery happens. Good rest promotes quicker recoveries. And most importantly, we stress that the rest in the beginning is the most effective: three weeks of rest right away saves the months or years needed when initial rest isn’t taken. This is where concussions become chronic: the initial healing didn’t fully happen and now conventional advice to rest becomes problematic. But doing no activity for months and years cannot be healthy, and is in fact depressing and isolating. Something else is needed. What is going on in this post concussion situation? Symptoms have persisted into the chronic stage, and seem to be evoked by a variety of behaviours. Some people get headaches and fatigue when they read, others get dizzy and nauseous from exercise. Individuals suffering from post concussion syndrome tend to adapt their lifestyle to avoid overly provoking symptoms. We demonstrate avoidance behaviour, the common response to pain. But when the thing we are trying to avoid is our entire life, full of its various pleasures, it becomes a delicate balancing act. If the goal is to prevent pain from restricting one’s lifestyle, this goal must look to the future. A painkiller does not work if it allows me to push myself for one day to the point of fatigue which requires a week to recover. Likewise, developing high pain tolerance in the face of symptoms contradicts this goal if it provokes an increase in neurodegeneration and associated symptoms in the long run. What makes this question so urgent is that the opposite could very well be true. Avoiding pain could very well be the cause of neurodegneration, if the situation is comparable to the pain required to re-strengthen hurt muscles. If injured cognitive functions require targeted activity to recover, pain associated with this activity is part of recovering. Leaving the vestibular, visual, processing, and language systems unhealed does not seem good for long term brain health. If pain goes along with the recovery of these types of systems, it is not a bad thing. This is the paradigm I have been living under for five years. To recover a deficit, I must work on this deficit. Sub-symptom threshold training would be ideal. This is when the activity is below the level that provokes symptoms. However, this is a challenge in practice when many things provoke symptoms, and fatigue is not compartmentalized. Once one thing tires me, my tolerance for other activity drops. Playing music usually helps me regain my energy, but if I am tired enough, the situation flips and it to provokes symptoms. So I can’t measure a standard sub-threshold activity's length and intensity and simply keep in that range. I have to use the symptoms themselves as a clue that I need to rest. Masking the pain that is a common symptom tends to lead to a bigger more debilitating crash later. For example, working out is healthy, but not if muscles need 3 weeks of recovery time after each session. The muscles would lose all the strength they had just gained, during that resulting inactivity. This idea is supported by concepts like the Parkwood Pacing Program. They advise avoiding cycles of high activity and subsequent low periods, and instead slowly building up strength in small increments. Extreme symptoms do not mean that further harm is occurring, but they may slow down recovery. This concept helped my healing because it allowed a balance between still pushing, but not feeling guilt in the cases when I push to hard. Guilt insidiously turns healthy activities unhealthy, so a framework to understand pain in a positive light is important. Attitude can make the same activity stressful and energy draining, or exciting, tiring but motivating. This is the reality when it comes to thinking about recovery. This framework has allowed me to balance the desire to avoid pain with the joy I get from certain activities that cause this pain. It means accepting pain as part of the road to recovery. No research can change this. What can change is the upper and lower limits. How much pain is too much? How much rest is too much? With many lifestyle aspects we don’t have a choice, we must learn to cope. But for other activities we do have a choice. We don’t have to take long drives, or go to loud concerts, or study at university. Certainly contact sports or military service push the limits of Post Concussion Syndrome. Activities with a high risk of re-injury should be avoided. But beyond that, the line is not clear. In the short term I might have less symptoms when I am not in school, but in the long term, school work might be the very activity that stimulates healing. More generally, what activities stimulate healing and which increase the likelihood of neurodegeneration? And by how much? The problem is, we don’t have an answer to this, so lifestyle decisions are difficult to make. How has pain limited my lifestyle the past 5 years? Big crashes limit my lifestyle, as does chronic fatigue. But the constant presence of pain can actually enhance my lifestyle if it is used as a clue to predict fatigue. It might be the very thing that lets me maximize the limited energy that I do have. In my lecture last week, I learnt that pain is an unpleasant sensory or emotional experience associated with actual or potential tissue damage, or described in terms of such damage. In all cases, pain feels like cell damage, but is not always. Knowing the difference is huge. It makes me wonder, if one day research will show that the pain evoked by my lifestyles does indeed cause tissue damage. Somehow, I think not. Despite living in a materialistic age, I know that I can’t grasp at immortality, and must live this life now, in these moments. I try to live a healthy life so that I can do the things I love, not to prevent me from doing these things. It would be for nothing if I spent my entire life not living, just to die with a healthy body. It was my first Christmas at home in 10 years. My family always has a big party with all our relatives — aunts, uncles, friends, turkey, beer, stories, laughter. Please click here to finish reading this amazing article by ADAM ESTOCLET. We are thrilled to present this article written by Belle Kim outlining some of the work our club has been doing in to provide concussion support at McGill! Check out the original article here, or scroll down to read it! Belle Kim for Her Campus McGill (HC McGill): What is SLICE? Abbie McLellan (AM): SLICE stands for Sports Legacy Institute Community Educators. Our parent organization is Sports Legacy Institute, which focuses on concussion education, policy and research. We are Community Educators, meaning our members will be trained in the official SLICE presentation, and present what they learn to middle schools and high schools. The goal is to educate our community, including the McGill student body, teachers, coaches, and parents about what a concussion is, why concussions are worth caring about, and what can be done if someone gets a concussion. HC McGill: Why the focus on sports? AM: Sports have caused concussions to come into the spotlight in recent years, making it an ideal topic to get the word out, especially to young people. Also, sports injuries tend to be under-reported because athletes have grown up in the culture of sucking it up for the team. If we can use the topic of sports to educate young people about concussions, hopefully what they learn will stick with them and help them in future situations. HC McGill: Who is SLICE geared towards? AM: SLICE is geared towards university students interested in educating younger students about concussions. Special interest may stem from students in fields such as, but in no way limited to, kinesiology, neuroscience, anatomy, and physical education. A student who has already received a concussion may also be interested in sharing their story. In addition, our club provides support to students who are dealing with concussions. HC McGill: How did you get involved? Have you had any personal experience with concussion? How did you deal with it then? AM: I got involved with the program after getting a concussion on April 5, 2013 while playing basketball at Rez Warz. Now, almost 19 months later, I am still dealing with symptoms from that concussion. This post-concussion syndrome probably occurred because I didn’t handle my concussion properly. I studied for four exams right after getting hit, not realizing that someone with a concussion needs mental rest as well as physical. I realize now that I was totally unprepared to handle my treatment, and saw that other people who had concussions were in similar positions. The thing about concussions is that recovery is totally dependent on proper treatment, but once you get a concussion, your ability to make smart decisions is impaired. As a result of not treating my concussion properly, I canceled all my plans for that summer, and only took one course when I came back to McGill. My life has been profoundly impacted. Some of those impacts have been good, for example, I got back into art and learned to play the guitar. In that sense, I dealt with the aftermath of my concussion very optimistically. After my experience, I saw it as essential to better educate my community so that next time someone gets a concussion, they will know that it is a serious injury, and will have the tools to treat it. 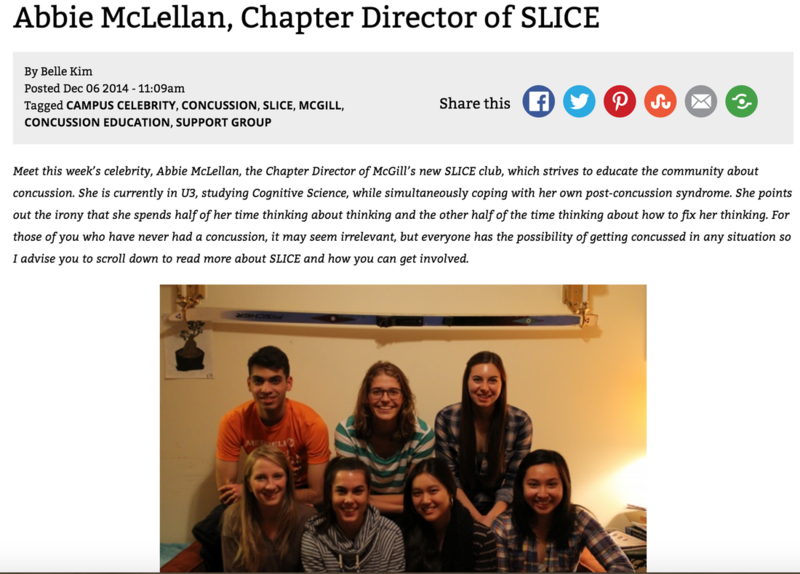 At the time of my concussion, McGill didn’t have any student support group, so I decided to bring the SLICE initiative to our campus. HC McGill: You must already have a lot of students interested in joining SLICE. How can one get involved? AM: You can check out the website to learn how to get involved. Right now, the two main options we offer are to become an educator, or join our support group. The great thing about becoming an educator is that even if you just do the training, the topics covered in the training are essential for all people to know. The support group is open to people with concussions, but also friends and family members of people with a concussion, in order to better support them in their life.The club is also working on a coalition between different medical experts in the field of head trauma. This will help make sure research doesn’t overlap, but also help treatment become more interconnected. Students who are interested in the research side of concussions can get in touch at sportslegacyinstitute.mcgill@gmail.com to find out more. HC McGill: I know that the club just begun this semester. It must be an exciting time for you. Can you tell me what the club's hopes and goals are for the future? AM: I think the biggest goal for us is that if a student gets a concussion on campus, they will know the steps to take: registering with MyAccess, talking to their advisor, getting accommodations, and finally resting. Or, if they don’t know what to do, they will know that we are here to help and answer all their questions. It is very difficult for students to stop studying during the school year, but sometimes rest is the most important thing. If our club can be the one to encourage and support students in the decision to rest, then we have succeeded in tackling the concussion crisis. HC McGill: Are there any events coming up that you would like the readers to know about? AM: We are very aware that McGill students are hitting the books for finals! Thats why we have decided to kick off our first big training session of the school year in early January. Coming to training is a great way to educate yourself, whether or not you plan on giving presentations in the future. Check out the McGill SLICE Faceook page or their website for more information and to share your concussion stories, among other's shared on the website. You are constantly dying. Your cells are, anyways, and they're what make you, you. Right? But if you are constantly physically changing, how are you still, mostly you? Just after the first day of university, before the novelty of higher-level education and meeting strangers from across the globe had even worn off, I needed to go shopping for dorm supplies and groceries. I borrowed a bike, but not a helmet. This was when I made my first mistake. On my way home, I was hit by a car. What happened afterwards was a blur, at best. Dizzy and disoriented, I trudged up the hill with my bicycle and bruised groceries beside me. Because I'd had multiple concussions before, this ostensibly resembled one of the minor ones and I thought I would be okay. Mistake #2. I continued to go to class, listen to music, go to the gym, and even train at ultimate frisbee practices. Mistake #3. A week after the incident, my hands starting shaking uncontrollably, my head pulsed with my racing heart, my nausea manifested itself into vomit, my legs were numb, and I felt as if I had ridden a rollercoaster for six hours straight. Something was seriously wrong. After visiting multiple doctors who determined that I was indeed suffering from a concussion, I was ordered to bed rest. "Vegetation" was the exact word Dr. Sung had used. 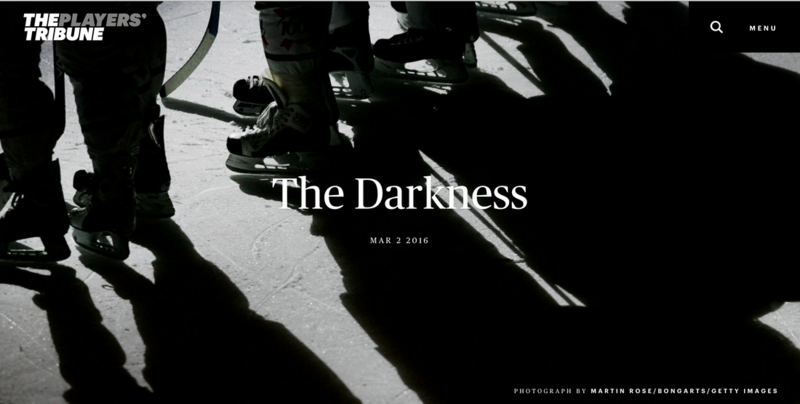 For three weeks, I was confined to the darkness of my room. This darkness began to seep into my mind as well, and the lack of human contact, music, and entertainment took its toll on my emotional well-being. What many people don't realize about concussions is that they consume your life. They swallow up what defines you and disintegrate who you are. It feels as if your life has been set aflame, not only because of the physical pain the fire causes, but also because of how it spreads throughout your life. And even when you try to fix yourself, progress is as slow, excruciating, and frustrating as a lone firefighter's battle with a raging wildfire. A concussion can destroy your happiness, your self-confidence, and your hopes and dreams, as quickly and easily as a match is lit. Since my concussion 4 months ago, I've struggled with simple math, perpetual headaches, and being able to remember details, everything from enzymes involved in DNA replication to people's names (and I used to be superb with names). I can't think or focus, I can't exercise or do any of the things I'm good at or enjoy, I'm nauseous more often than not, and I'm dizzy always. I sleep for twelve hours each day but am still exhausted. Mostly, I feel like I'm a different person than who I was before, and I wake up each day hoping, wanting, wishing, that I would just feel normal again. I graduated high school counting my many, many blessings. I was athletic, playing at provincial and national levels, I was intelligent and diligent, I was ambitious and motivated to achieve my lofty dreams, I was making a difference in my community, and I was surrounded with friends and family who laughed and loved, and I too, laughed often and loved always. My concussion has stripped me of most, if not all, of these blessings. And because they all contributed to my visualization of self-image and self-worth, I've also lost pieces of myself. The fear of never knowing if I'll find them again scares me most. I received a concussion April 2013 playing basketball at a McGill Rez War event. I didn't get the chance to rest, instead writing 4 exams, and found myself helplessly upside down once summer hit. I canceled all my summer plans, and ended up returning to school in the fall for one class. Recovery has been slow but curiously rewarding. The English language, for the most part, is equipped with a word for just about any feeling, apart from long vague concept like the German schadenfreude, which is the guilty pleasure experienced when something bad happens to someone you are friends with, but also jealous of. Even those few missing words seem easily navigable by employing a sentence to describe them, as I just did. The first time I stumbled upon a concept I couldn't properly communicate through words happened when I received a concussion playing basketball. I have found such a concept that has given me much grief in describing. Perhaps that is due to my concussion itself, which at times blurs my thinking, but I think it is more profoundly related to my concussion, because this concept is actually my main concussion symptom. No past medical experience has given me the vocabulary to describe it, because it is specific to my head injury. I guess the list of concussion symptoms is made by doctors and medial professionals, not the ones with concussions. Perhaps they never realized to ask about something more, something that was not on their list. It could also be that I experience a symptom unique to myself, just as my entire concussion journey was unique. None the less, I am going to try my best to communicate what relatable experiences I have had. I am going to try my very hardest to use, not just a sentence, but many paragraphs, to describe a symptom that I hope will, in years to come, have its own unique name and its own unique scientific understanding and medical treatment associated with it. As I started seeing doctors, I found myself bombarded with a list of symptoms I was supposed to identify with. Dizziness, fogginess, fatigue, headaches, pressure in the head… The list went on and not once did I feel confident in the identification of my true symptom. It was not that they are wrong, all of them have been felt at various times in my experience. However, I knew that they were not exactly right. They all described things I have experiences before my concussion, and a concussion was something entirely different, much more than frequent headaches and fatigue. If you asked for a lime and I have you a lemon, you'd most likely manage. Yet you would notice a difference. Its is this level of difference that leaves me feeling uncomfortable that my concussion cannot be described. I am a girl, equipped with a lemon, trying to convey the taste of a lime. To start let me say that if you mixed a light headache, a bit of dizziness and fatigue, and maybe a pinch of pressure together in a fog and then poured that into you head after running in the wind and sun all day long, you probably would have a good starting point for understanding a concussion. For simplicities sake, one could just say headache and be done with it. But I think the uniqueness of this hard to grasp symptom is worth dwelling on, in order to address the uniqueness of concussions themselves. Where a concussion varies significantly from a headache is that it is not exactly the pain that makes it debilitating. It is more like it is actually debilitation itself, an internal protest to continuing the activity at hand. Sometimes I find it causes my speech to slur, as if by slurring my words and keeping my mouth from opening fully, I fool my brain into thinking I am not actually talking. When this happens, I become overwhelmed by an internal cringe and usually disengage from whatever activity I am involved in. And here is what truly sets it apart form a normal headache. In most cases, (exempt the most extreme), ten minutes of meditation and silence result in a decrease in symptoms. This "headache" I experience is acutely responsive to my activities. If you got zapped and random, you would keep active. But if you got zapped in direct correlation to your activity, you would stop that activity. But what about when that activity is life? My closest relatable relatable experience is not actually a headache, but the removal of my wisdom teeth. For a week or two after I had them out, I complained not exactly of pain, but more of an inability to truly open my mouth, as if elastic bands held my teeth together. Maybe what I am trying to convey is that despite the pain, it is not always the pain that is the main symptom. My head hurts, but more significantly, it resists. This often leaves me grappling to communicate to my friends ideas that are clear in my head, but 'resist' expression. The mental work of putting them to words is to much. As I heal, I find this problem decreases, yet its often in the back of my head, a slight buzz, and I know its still here. But what is scariest of all is when I don't notice it, and it seems as if the concussion has become a part of who I am. To realize that this state of decreased health has become my new reality. Now I know finding a word for this symptom will not help convey a priori what a concussion feels like anymore than spinning in circles can emulate alcoholic intoxication. But if what I describe is not specific to me, if it rings a bell to other people with head injuries, then finding a word for it may make people suffering understand that they are not alone, and facilitate communication for a brain that is struggling to do all the things it once took for granted.